Jeff Jones has provided expertise in the medical cannabis field to Californians for over twenty-three years. Jeff’s horticulture knowledge, troubleshooting skills, and easy manner make learning the basics easy for beginners and a challenge for the experts. Jeff co-founded the Oakland Cannabis Buyers’ Cooperative (OCBC) in 1995 simultaneously creating the downtown cannabis-friendly area known as “Oaksterdam” (named after the first two cities to regulate marijuana). With Jeff’s assistance, the City of Oakland became the first U.S. City to contract with a medical cannabis provider back in 1998, and implement a successful city program to issue compassionate provider permits in June of 2004. Jeff set a precedent self-regulatory practices that would eventually become the tenants of Senate Bill 420 and the Attorney General Guidelines of 2008. Jeff was named the defendant in the OCBC Federal Civil case, one of the longest-running medical cannabis cases in history as it traveled all the way through the Supreme Court; the first to ask the question of if cannabis can be provided for medical necessity patients. He transitioned the OCBC into advocacy and education with the Patient ID Center (formerly OCBC) and shared his expertise with hundreds of thousands of medical cannabis patients, professionals, and experts. The mission carries on the tradition of issuing private ID cards and offering patient services, education, and referrals to compassionate provider groups, caregivers, and lawyers in California. Jeff also helped establish Alameda County Patient Services, which provided patients and caregivers official Medical Marijuana ID cards in Alameda County, California. He has been educating professionally as the horticulture expert, politics and history instructor for Oaksterdam University since 2007. 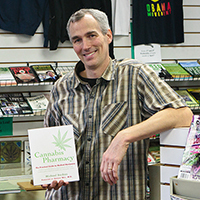 In 2010, Jeff Jones was co-proponent of the Prop 19 Control, Tax and Regulate Cannabis Act, the first statewide campaign to legalize cannabis in modern history, hoping to protect patients. The Patient ID Center not only prints your student ID cards, but they now also print staff cannabis badges for businesses across California and beyond. Jeff is poised to finally reopen the OCBC this summer after providing expertise in the medical cannabis field for over twenty-three years. Jeff shares two young sons and a baby daughter with Dale Sky Jones.